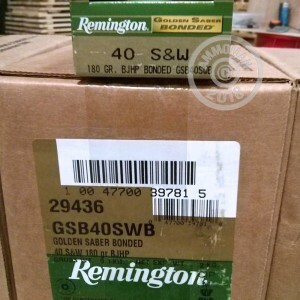 Remington Golden Saber ammunition is a popular carry and service load for CCW holders and police officers. That's because it offers dependable performance thanks to its brass-jacketed bonded-core bullet design, which delivers dependable penetration and mushrooming to stop threats quickly. These .40 S&W cartridges are suitable for popular police sidearms like the Glock 23 and fire a heavy 180 grain Golden Saber bullet at 1,015 feet per second. This ammo comes in convenient 50 round boxes and uses non-corrosive Boxer primers and nickel-plated brass cases. Find everything you need at AmmoMan.com and get it with free shipping on all orders over $99!